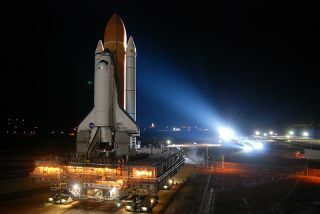 Space shuttle Discovery, bathed in Xenon lights, rolls out to Kennedy Space Center's Launch Pad 39A on Jan. 31, 2011. For the first time, the U.S. Environmental Protection Agency has decided to limit how much of the rocket fuel chemical perchlorate is allowed in drinking water. The move reverses a 2008 decision under the Bush administration not to regulate the chemical. While many environmental leaders and public health advocates applaud the decision, some industry groups argue that low levels of the chemical pose no risk, and the regulation isn't necessary. Perchlorate can impair thyroid function by preventing the gland from absorbing iodine from the bloodstream. This can disrupt the thyroid's ability to produce hormones critical to developing fetuses and infants, the EPA said. "Our decisions are based on extensive review of the best available science and the health needs of the American people," said EPA Administrator Lisa P. Jackson in a statement. Perchlorate is a naturally occurring compound, and is also produced for manufacturing. It is commonly used in solid-rocket propellant, including inside of NASA's space shuttle's solid rocket boosters. It's also an ingredient in fireworks and flares. "I think this is a real step forward," said Thomas Burke, associate dean for public health practice and training at the Johns Hopkins Bloomberg School of Public Health in Baltimore. "Perchlorate is a very pervasive contaminant. It has all the scientific underpinnings of something we have to be concerned about, and it's time to move forward." While studies have shown the chemical is harmful at significant levels, some dispute the charge that even low doses of perchlorate are dangerous. The Perchlorate Information Bureau, an organization funded by the aerospace industry that researches the chemical, said a national perchlorate standard is not necessary and wouldn't provide a meaningful public health benefit. It argued that at the levels commonly found in most drinking water supplies, perchlorate is not harmful. Yet Burke said the research on perchlorate is solid enough to be worried about such levels. "I think in science, particularly if we're thinking about public health, there will always be some uncertainty," Burke told LiveScience. "But that uncertainly shouldn't be an excuse to do nothing when we see widespread exposure to something that's used to propel rockets." The EPA collected data on perchlorate from 3,865 public water supplies between 2001 and 2005. It found that 4.1 percent of these samples registered perchlorate at levels greater than 4 ppb, the minimum reporting level of the test. The average concentration among samples that tested positive was 9.85 ppb. The EPA has not indicated what concentration it plans to deem safe. The agency will now embark on what could be a multiyear process to assess the risk and set a standard. Some individual states already regulate perchlorate. In California, the maximum allowed level of perchlorate in public drinking water is 6 parts per billion. "I applaud EPA's decision to regulate perchlorate in drinking water, which has been found at dangerous levels nationwide," said U.S. Sen. Dianne Feinstein (D-Calif.) in a statement. "Americans simply shouldn't have to worry that the water they drink and cook with will make them sick." Aerojet, a rocket and missile company based in Rancho Cordova, Calif., is already working to clean up perchlorate leaked into the groundwater, and said it has drastically cut down on the amount of perchlorate residue produced in the first place. "The perchlorate contamination that we're addressing today is from processes and practices years ago," said Chris Conley, vice president for environmental health and safety at Aerojet. "Today we control the use of perchlorate and control it such that we do not have the releases that happened in the past. Actually when it comes to perchlorate remediation, we're probably one of the leaders in the country on how to do it." Even in states that have no perchlorate regulation yet, rocket companies say they've established closed-loop systems that prevent any of the chemical from leaking into the ground. As such, officials maintain that any new EPA regulation on perchlorate shouldn't pose a serious issue for their business. "We have been very cognizant of treating our water since the 1980s," said George Torres, spokesman for Alliant Techsystems (ATK), an aerospace company headquartered in Minneapolis, that builds the solid rocket motor used to launch the space shuttle. "As far as future production and current production, any perchlorate we use actually comes bound in a crystalline form where it's mixed with ammonia so it doesn't pose a threat, and we mix it that way into rocket fuel where it gets consumed," Torres said. You can follow SPACE.com senior writer Clara Moskowitz on Twitter @ClaraMoskowitz.